The vineyards of Chateau Clamens are located at the entrance to Toulouse, on the sandy loam and clay soil of the old terraces of the river Tarn which offers good heat retention. Coupled with a favourable climate – over 2,000 hours of sunshine a year, fairly cool nights and little but regular rainfall. 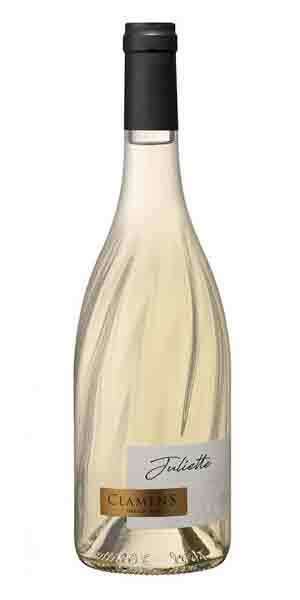 Juliette Blanc is 100% Gros Manseng, a grape common in the Jurancon region of Southwest France and Gascony. Gros Manseng wines can be deeply pigmented for white wines with floral and fruit aromas and flavours, think lemon, quince and apricot, along with flowers and spices. Citrus and pineapple on the nose. The palate is dry with good structure and balance of fruit, florality and freshness. Broad with juicy crunchy fruit; very refreshing.